You know every time you set out on your motorcycle that an accident could be devastating, even life-threatening. 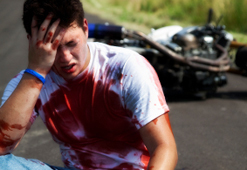 Your risk of injury on a motorcycle is much higher than if you were surrounded by walls and a roof as in a car. Unfortunately, because so many drivers fail to see, ignore or are even aggressive toward motorcyclists, your risk for an accident is also higher. According to the National Highway Traffic Safety Administration (NHTSA), in 2007, motorcyclists were about 37 times more likely than passenger car occupants to die in a motor vehicle traffic crash and 9 times more likely to be injured. Unfortunately large medical bills go hand in hand with serious injuries. In New Jersey, most motorcycle policies do not cover medical bills. In addition, many auto insurance policies, which usually cover medical bills from an accident under the "No Fault" provisions, typically exclude motorcycles, so that you likely won’t be covered under your automobile insurance policy in the event of a motorcycle accident. Any number of things can cause a motorcycle accident, from a problem with your bike, road debris, to other drivers cutting you off. When you call Douglas Standriff, New Jersey Certified Civil Trial Attorney, you’ll know after a brief interview whether you have a case and can reasonably expect to win compensation from the responsible parties. Mr. Standriff knows how to investigate a case and apply New Jersey law so that you get every penny to which you’re entitled, from medical bills to property damage to lost income and pain and suffering. Great peace of mind comes with knowing your bills and expenses will be paid by the people who put you in this position. Mr. Standriff will personally handle all aspects of your case, and will only receive an attorney’s fee when you win your case.